And it was told the Gazites, saying Samson is come hither. And they compassed him in, and laid wait for him all night in the gate of the city, and were quiet all night, saying, In the morning, when it is day, we shall kill him. a. 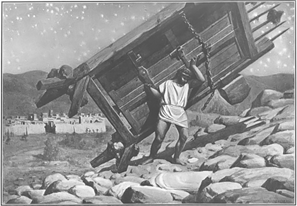 Some believe that Samson did not consider the impact of his coming to Gaza. “He did not take into due consideration the impact his visit would have upon the Philistines” (Butler, 134). 1) If Samson thought he would not be found out, he was foolish. 2) If Samson thought the Philistines would turn their heads to his visit, he was even more foolish. b. Surely Samson knew how the Philistines would react to his visit, but he did not care. c. Silent: quiet all night. 1) The enemy will always take advantage of his opportunities. 2) Sin will use these same tactics against us in order to slay us. a. The Philistines have no respect for Samson’s life. b. They see him as a threat that needs to be completely extinguished. c. Lesson: Our enemy has this same end in min for us (I Pet. 5:8). And Samson lay till midnight, and arose at midnight, and took the doors of the gate of the city, and the two posts, and went away with them, bar and all, and put them upon his shoulders, and carried, them up to the top of a hill that is before Hebron. a. The gates of the city were only opened during the day. They were closed at night and the guards would sleep, thinking that all was well in the city. b. Samson took advantage of their “security” of mind. While they slept, he acted. a. No one that I have read has ever tried to estimate the weight of this gate. It had to weigh several hundred pounds. b. Had the gate been broken down and cast aside, it would have been an unbelievable feat of strength. 1. The strength required to accomplish such a feat as this was not mere human strength. This was supernatural strength, strength given by God. 2. Samson’s feats of physical strength endear him to many people. a. Often we are tempted to overlook moral deficiencies of men if they are strong and powerful (e.g., sports figures, actors, politicians). c. Physical strength does not make up for moral weakness which was seen in his being with a harlot. We need to change our perspective and see try to see people as God sees them. 3. The city of Gaza and the Philistines are now extremely vulnerable. a. Remember: The name “Gaza” means “stronghold.” It is now compromised. b. The gates being removed made the city vulnerable to attack. Its “authority” had been taken away. 4. Samson is free again. 5. “This is not the first time Samson has been saved from perilous situations because of the grace of God. But it will be the last time! There are indeed limits to God’s grace…” (Butler, 139). a. Good things happen in the life of a person and evil things happen. After they happen, time continue to pass by. b. Some men learn from their mistakes and do better. Others never learn and do worse. c. Lesson: Samson never did learn. Do we? a. This is the third woman with whom Samson has had some form of relationship. b. “It is not, of course, necessarily evil for a man to love a woman. What makes it evil is when the woman loved is an evil woman. 1) All three of the women in Samson’s life were evil. a) The first was a Philistine. b) The second was a harlot. c) The third was Delilah. 2) He was attracted to filthy females like flies are attracted to garbage. c. Lesson: When one’s sensual appetites dominate him, he will be blind to the perils of his pursuit (Prov. 7:22). He goeth after her straightway as an ox goeth to the slaughter, or as a fool to the correction of the stocks.